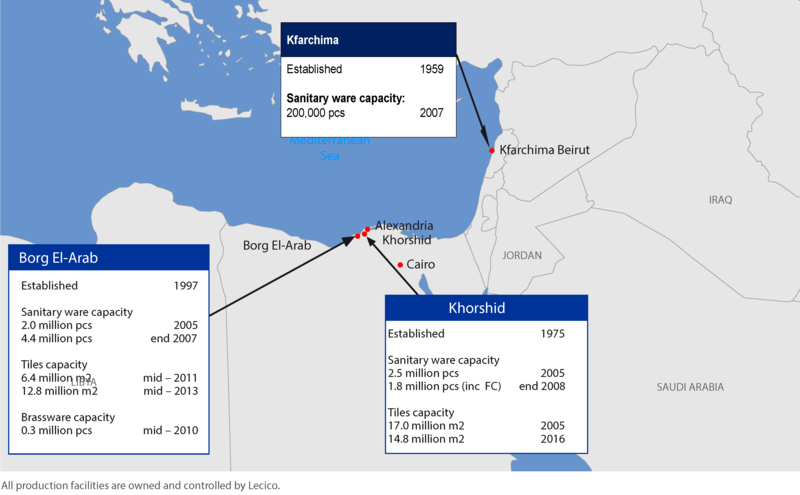 Lecico is one of the largest sanitary ware producers in the world and a significant ceramic tiles producer in Lebanon and Egypt. Our factories in Alexandria – Egypt and Kfarchima – Lebanon. Lecico employs more then 6,000 people and has the capacity to produce more than 6.5 million pieces of sanitary ware and 34 million square meters of tiles per year. Lecico manufactures a range of internationally-certified sanitary ware products sold both under the Lecico brand and for other manufacturers and customers under their own brands in over 50 countries. Lecico also produces a wide range of ceramic wall and floor tiles that are sold principally in Egypt and Lebanon. Over 55% of Lecico’s sanitary ware production is sold internationally through our trading subsidiaries in the United Kingdom (Lecico PLC) and a strong network of prominent distributors, agents and specialized merchants across Europe, the Middle East and Africa. Lecico is also a major manufacturer for international sanitary ware brands with over 25% of sanitary ware exports produced on behalf of other manufacturers. Lecico is one of the largest sanitary ware brands in the United Kingdom and Ireland. © 2019 Lecico Egypt. All Rights Reserved.